Sixty years ago, in the spring of 1945, Allied forces liberating Europe found evidence of atrocities which have tortured the world's conscience ever since. As the troops entered the German concentration camps, they made a systematic film record of what they saw. Work began in the summer of 1945 on the documentary, but the film was left unfinished. 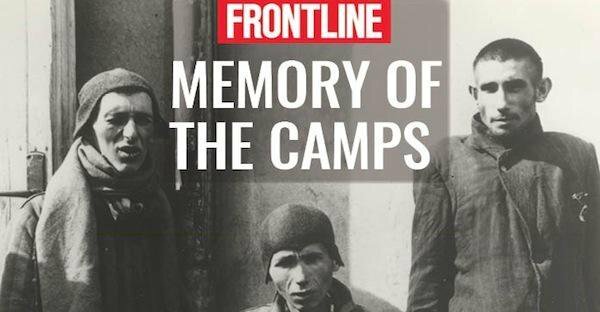 FRONTLINE found it stored in a vault of London's Imperial War Museum and, in 1985, broadcast it for the first time using the title the Imperial War Museum gave it, 'Memory of the Camps. You may have heard the news that the world will soon see "Alfred Hitchcock's unseen Holocaust documentary." That intriguing sounding announcement belies a more complicated reality. This new, restored film draws on footage shot by the British Army Film Unit in Nazi concentration camps in 1945, which was actually released in the mid-80s, in a film called Memory of the Camps. This first version, which you can watch above, took nearly forty years to reach the public, when it was finally released in 1984, first at the Berlin Film Festival, then on PBS. Until that time, the original footage sat unused in storage at the Imperial War Museum, consigned there after the Allied military government decided that such publicity for Nazi atrocities wouldn't get Germany reconstructed any faster. How, right in the aftermath of the Second World War, might we have reacted to its hauntingly revealing coverage of Bergen-Belsen? According to the Independent, a screening of Memory of the Camps' material left even Alfred Hitchcock, certainly no stranger to death and malevolence, "so traumatised that he stayed away from Pinewood Studios for a week." He'd shown up there in the first place as an advisor, and in that capacity offered director Sidney Bernstein advice on how, visually, to place these shocking revelations in a recognizable geographical and human context. "He took a circle round each concentration camp as it were on a map, different villages, different places and the numbers of people," Bernstein remembers. "Otherwise you could show a concentration camp, as you see them now, and it could be anywhere, miles away from humanity. He brought that into the film."